Lyme disease is a rising epidemic in every state in the nation. The Lyme Disease United Coalition was formed to educate the public about tick safety. Enjoy nature, but take precautions. And, it is not just the pesky tick transmitting Lyme disease (Ld). It can be passed by ticks, fleas, biting flies, Keds, Lice, and mosquitoes. The bacterial spirochete can invade and infect any organ in humans and animals. If not diagnosed early, if left untreated or not treated adequately, it may develop into debilitating arthritic, cardiac, neurological, digestive, or psychiatric conditions. It can cause long-term disability or can even be fatal. It can cross the placenta into the fetus, and its DNA can be found in breast milk. It is called the “Great Imitator” for it mimics other diseases such as: Multiple Sclerosis, Parkinson’s Disease, ALS, Fibromyalgia, Rheumatoid Arthritis, Chronic Fatigue Syndrome, or an array of mental disorders. Some ticks can transmit more than one pathogen. The pictures show three of the common adult ticks found in the United States. Younger ticks that are smaller and less distinctive may also transmit disease. Black-legged ticks (Ixodes scapularis) can transmit several tick-borne diseases, such as anaplasmosis, babesiosis, and Lyme disease. Lone star ticks (Amblyomma americanum) have been linked to ehrlichiosis and Southern Tick-Associated Rash Illness (STARI). So what are you supposed to do to avoid contracting Ld – stay inside with the shades shut? No! · Tuck pants into socks or put duct tape around the cuffs. If going into deep woods, wear layer of duct tape on lower pants, sticky side-out, to attract the tick to attach to the tape and not attach to your body. · Put clothes into dryer for 30 minutes to kill ticks – washing clothes will not kill ticks! · There are products containing Permethrin for clothes—do not use on children—is a very effective product for adults and recommended for hunters. Create Tick-Safe Zones. Many infections happen in your own yard! Remove Leaf Litter and brush around your home and at the edges of lawns. Place wood chips or gravel between Lawns and wooded areas. Mow the lawn and clear brush regularly. Keep playground equipment, decks and patios away from yard edges and trees. Apply pesticide to control ticks. 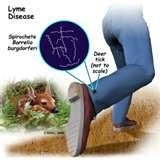 most do not have the telltale bullseye rash, and there are two stages of Lyme disease. There are 300 strains of the Lyme bacteria in the United States and Canada. All tick species, even the good old Dog tick can pass Lyme disease onto the human host. What’s more, ticks are capable of transmitting the infection 12 months a year, says Iowa State University entomologist Ken Holscher, “They do not reach the same level of development at the same time each year,” he explains, and thus the ticks that reach adult stages by the end of the summer can remain active as temperatures drop. “It takes two things for a tick to survive in fall and winter,” Holscher says, “An available host – ticks aren’t picky – and relative humidity.” During hunting seasons, ticks can be found in thick brush or on tall grasses. · Only 1/3 of infected people may have a rash or a bulls eye rash. Late Stage: (Chronic Lyme) These may occur weeks, months, and even years after the bite and the symptoms may come and go. Peak disease is associated with increasing numbers of spirochetes in the tissues while regression follows the antibody response. It is very cyclic and fluctuates in intensity so that symptoms are present on some days and not on others. Lyme disease is a very serious illness. It can cripple you, cause brain damage, blindness, and arthritic pain on an ongoing basis. Early detection is very important. With early detection there is a cure with antibiotic treatment. Late-stage Lyme disease is incurable, and has lead to several deaths. Long-term antibiotic treatment is necessary for late-stage. Have fun in the sun, but do a tick check when the sun goes down!